On January 3, 2017, Governor Andrew Cuomo of New York announced the Excelsior Scholarship, a proposal that would provide free tuition at the City University of New York (CUNY) and the State University of New York (SUNY) for qualifying students from families making less than $125,000 per year (comprising 80% of New York households). The proposal, if passed, would help set new expectations that a college education should not be a life debt sentence. Senator Bernie Sanders was a featured guest at Cuomo’s Excelsior Scholarship announcement, a clear reminder of the important role that the left-wing senator continues to play after his 2016 presidential campaign. Sanders tapped into the enormous youth radicalization that has taken hold since the financial crash in 2008, with students and young workers fighting back against the epidemic of high college costs, massive student debt, and low-wage work. Sanders’ campaign proposals to make college free and forgive student debt made him the most popular presidential candidate among voters under 30, receiving over 2 million more votes during the primaries than either Hillary Clinton or Donald Trump. It is clear from the Excelsior Scholarship announcement that Cuomo, widely recognized as positioning for a presidential run in 2020, is drawing lessons from Hillary Clinton’s defeat and looking to tap into the national mood clamoring for policies that benefit the working class and youth. As promising as the Excelsior Scholarship proposal is, however, it is not “revolutionary,” as Senator Bernie Sanders claimed at the announcement. The CUNY system was completely free until 1976, yet Cuomo’s proposal falls far short of a return to free tuition. The scholarship would only fill the gap between existing student aid and tuition, meaning that poorer students already receiving more aid would reap fewer benefits: for example, there’s no additional stipend for low-income students to receive support for housing or books. Additionally, under the guise of incentivizing on-time graduation, the scholarship only applies to full-time students, ignoring students whose financial and personal responsibilities prevent them from attending college full-time. Unsurprisingly, the scholarship provides nothing for the thousands of undocumented students at CUNY and SUNY. Politically, for the proposal to become law, Gov. Cuomo must win votes from the State Legislature. The New York State Senate includes powerful Republicans whom Cuomo has shown a willingness to please by discarding or watering-down progressive proposals. And Cuomo has actually been a steadfast opponent of public universities for much of his term: just last year, he proposed a budget cut of $400,000 to CUNY, despite the state and the city of New York both reporting a budget surplus. Today, total public funding of CUNY is at an all-time low, with tuition-paying students making up the difference. While Cuomo’s proposed reform should be welcomed despite its shortcomings, students should also organize independently of Cuomo and keep up the pressure in the streets and on elected officials to push for even more ambitious reforms. Cuomo’s previous shape-shifting on public education means that working-class students can’t rely on him or the establishment Democratic machine he represents. In addition, labor unions like the Professional Staff Congress, Civil Service Employees Association, and graduate students who are organizing new unions can play a critical role helping support and build these efforts. Beyond New York, we should spread the movement for more scholarships, lower tuition and debt relief across every state in the country. The millions of young people who fueled Sanders’ historic election campaign are responsible for the newfound attention on proposals for free education and student debt forgiveness. 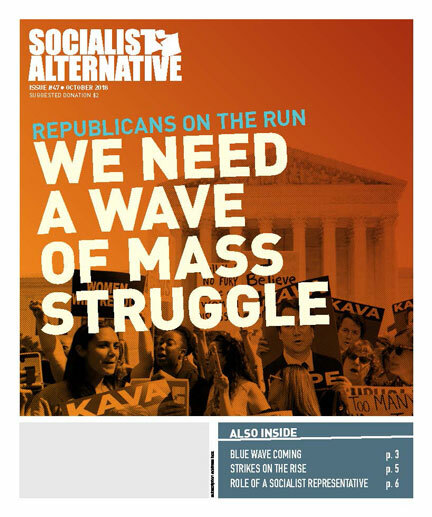 Socialist Students, a student-led initiative of Socialist Alternative, calls for rebuilding a fighting student movement as an independent force to demand massive tax increases on Wall Street and the super-rich to provide quality, free public higher education for all, including money for textbooks and housing — two of the biggest costs for students. We also oppose funding free education on the backs of instructors, grad students, and campus workers who deserve living wage jobs and decent union contracts. Ultimately, we need an education system geared to the needs of 99%, not the 1%: putting the needs of educators and students over the needs of a capitalist, for-profit education system.